Every moving job is unique. Over the years, we accumulate furniture & belongings that suit our individual tastes. A moving company who understands this will be the best one to customize their services to meet your needs. An honest and understanding mover will guide you in the right direction. 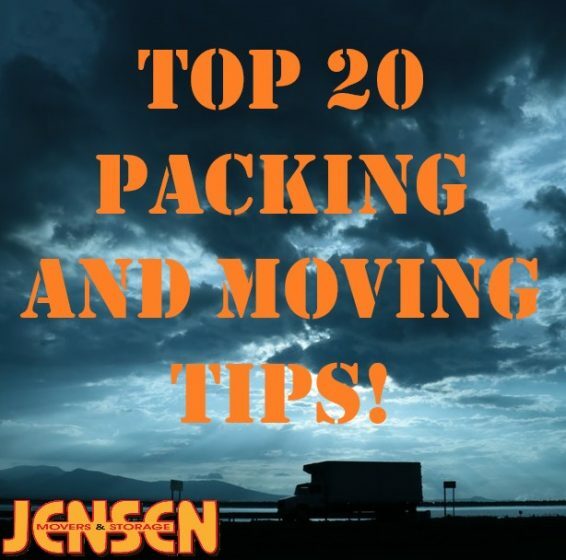 With over 100 years in the relocation industry, our family is sharing our top 20 packing and moving tips with you. Happy moving! China, crystal and all fragile ware must be paper wrapped and packed in strong containers - preferably dish packs. Dish packs are extra strength & corrugated for maximum protection. Pictures, mirrors and glass/granite/marble tops must be packed for safe transport. For long distance moves, crating is the most secure option and essential for items of extraordinary value. Brooms, mops, curtain rods, rakes, etc. should be tied together. Small appliances, flat screen televisions and electronics must be wrapped and packed. Books must be packed in small & sturdy cartons. When grouped together, books can become too heavy to move in a large box. Lampshades should be packed separately from their bases. They’ll usually fit into a medium or large carton. Wrap your lampshade in white paper, place alone in the carton, and use extra materials for cushioning. While costlier, always use white, un-printed paper for packing. Newspaper or magazine ink could rub off and damage your belongings. Use wardrobe cartons for hanging clothing. You do not need to remove your clothes from their hangers. For local moves, clothes & linens can be left inside dresser drawers. For long distance or storage moves, they should be packed. You can also use them as cushion for your fragile items. Dried and canned food can be packed in advance. Refrigerated and perishable items are not recommended on a moving truck. Flammable materials such as turpentine, cleaning fluids, paints, spray cans, ammunition, etc. cannot be moved by the moving company. Check with your township to see if they offer free hazmat disposal. Lawn mowers and other gas-powered lawn equipment must be drained several days in advance. Large appliances may need servicing prior to and after transport. Check with your appliance manufacturer before you make your move. Plants can be transferred on the truck, but keep in mind the truck is not climate-controlled. If you’re moving long distance, make sure there aren’t any species restrictions in your new state. Due to licensing restrictions, your moving company cannot transport pets or humans. Pets should be kept away from the moving site, as they could become distressed. Keep your handbag, checkbook, wallet and other personal valuables either on your person or in your car on moving day. You do not want to find these items accidentally packed and loaded on the truck. You are responsible for moving jewelry, keys, alcoholic beverages, firearms, coin collections, valuable documents and other items of intrinsic value. You are responsible for the removal of attached fixtures, such as towel racks, electrical, curtains and rods, built-in items, etc. Check with your realtor prior to moving, as these items could be considered part of the sale and unlawful to remove. Do not roll mattresses. Your movers should provide dis- and re-assembly of beds with their service. Loose carpeting can be rolled and moved. You must arrange for the removal of wall-to-wall carpeting. Have you found a mover yet? Make sure to ask these top five questions to ask a mover. Buy your packing supplies here! One more moving tip! Always schedule a free, in-home estimate prior to scheduling your mover. Ready to schedule? Click here!